One of my personal commitments for 2019 is to have a better relationship with my food. By that I mean, to understand where it comes from, what it is made with, and what it does to my body. Pamela Brown, who teaches a class on sourdough baking at the California Folk School in Los Alamos, bakes so much bread she often gives it away. With simple and limited ingredients, sourdough can be a good way to introduce yourself to home baking. Most importantly, I want to start making more of my own food—growing my own vegetables, making my own preserves, jams, condiments, and, naturally, my own bread. It’s part of an overall goal to extricate myself from some of the more detrimental elements of our food economy. Learning to bake your own bread is a fast, cheap, and easy way to begin that process. A few months ago, I was given a batch of sourdough bread starter from Three Flies on a Knife bakery. I was excited but honestly didn’t know quite what to do with it. 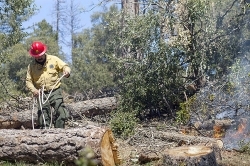 Luckily, there are plenty of local resources that can help. Jon Hooten and his wife, Jennifer, run the California Folk School in Los Alamos, which offers classes in artisan and homesteading activities such as wrangling chickens, soapmaking, leather crafting, and baking sourdough bread. He said sourdough was a popular class for people looking to learn on a hyperlocal basis. One of those people is Pamela Brown. The story of how baker Pamela Brown discovered her passion for sourdough bread wasn’t love at first sight. In fact, it was the exact opposite. Local sourdough bread is unique because it is created by bacteria specific to the environment it’s in. 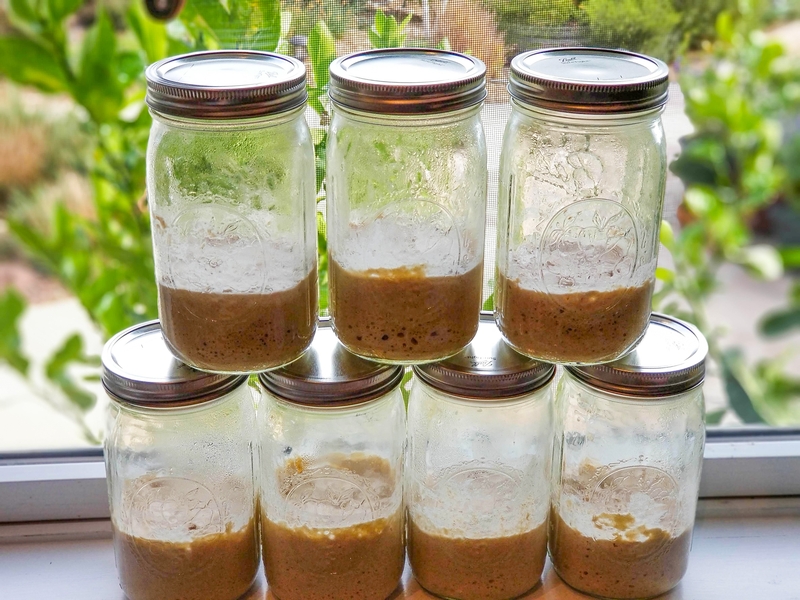 At the California Folk School, students learn how to feed and grow their sourdough starter as well as bake bread from it. But as her roommate showed her how the mysterious bubbling pile worked and how to feed it, Brown became more and more intrigued. She started to make bread with her friend, and a lifetime passion for the art of sourdough baking was born. She’s been baking for years, so much so that she often finds herself giving away more of her bread than she eats. The key to understanding sourdough bread is understanding what it starts with. Sourdough is defined by the fact that the yeast is wild, Brown explained, not commercial. The mysterious blob that looks like it came from the Black Lagoon is actually just sourdough starter. Sourdough is made from wild yeast, unique to the environment it’s created in. You can either build your own starter with water and flour or you can use someone else’s starter “blob” (as bakers like to call them). Blobs are fed a diet of water and flour, producing carbon dioxide as waste, which makes the bubbles starters are known for. Because wild yeast needs a little more coaxing, baking sourdough is a longer process. You can make a loaf of bread in a few hours, but sourdough can take a few days. Once you have your culture sorted out, you can move on to baking. Most local bakers (as well as many around the country) use a simple modified version of a famous recipe created by the bakers at the legendary Tartine bakery in San Francisco. Brown said it’s a very reliable and thought-out recipe (Martha Stewart has been known to use it as well). Having a scale is an absolute must. Ingredients and measurements must be precise in baking, to ensure you get the results you’re looking for. What comes next is a process of stretching and folding similar to kneading. Brown said the purpose is to get the strands of gluten in the dough to line up so it eventually rises. This involves at least a three- to four-hour ritual. 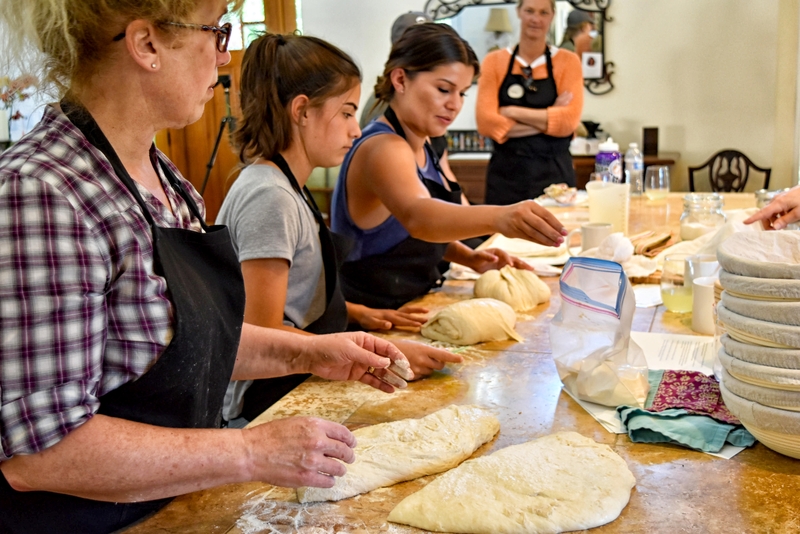 California Folk School offers classes on sourdough baking as well as other artisanal and homesteading skills. For more information, visit cal-folk.com/. A series of kneading and resting/proofing occurs before it’s time to bake (remember, don’t set your dough on the counter, either). Baking involves putting the dough in a very hot oven (a Dutch oven is also a great tool for this process). Also, don’t be worried about a very dark almost black crust—that’s the sign of a perfect sourdough loaf, and one Tartine is famous for. Brown said the dark crust is a sign of good caramelization on the bread. One thing Brown emphasizes is not to get too hung up on perfection. There is a beautiful historic relationship humans have with bread, through its cultivation and creation over hundreds of years. Amateur bakers have an opportunity to get in touch with that in their own kitchens. Arts and Lifestyle Writer Rebecca Rose is quite sour. Contact her at rrose@santamariasun.com. • Don’t miss out on Valentine’s Day at the Santa Maria Inn’s Century Room. Entrees include soy rum pork shank, a French bouillabaisse, Kobe beef flat iron steak, and quinoa stuffed bell peppers. The $65 cost includes four courses and is the perfect way to woo your special someone. Celebrate Feb. 14 at 801 S. Broadway, Santa Maria. • Also, don’t forget Root 246 for dinner on Valentine’s Day. The restaurant 86’d its two four-course prix fixe menus, but will be offering a handful of lovingly created specials as well as a vegan chef’s creation. Reservations are recommended if you want to enjoy this special day at 420 Alisal Road, Solvang. • I can’t let go of how amazing First and Oak’s Kurobuta pork belly looks. With grape gastrique and fennel four different ways in a mousse, fried, roasted, and dusted on grapes, it really is just a wonderful and unique dish that celebrates the season. Try it at 409 1st St., Solvang. • Did you know Boonie Thai in Santa Maria does snow crab fried rice? It’s a unique and refined take on a classic and definitely one worth trying ASAP. Of course, you could always try the Thai Sea Chest as well—flat rice noodles tossed with shrimp, scallops, squid, crab meat, and other goodies (below) at 618 E. Main St., Santa Maria.